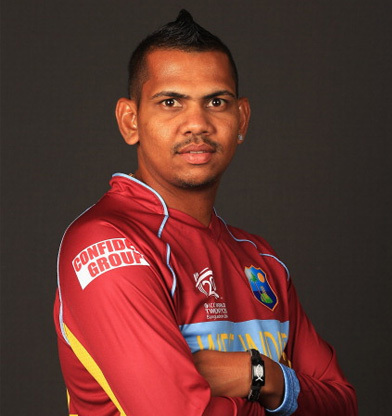 Sunil Philip Narine (born 26 May 1988) is a Trinidadian cricketer who plays for the West Indies in all forms of the game. Primarily an off-spin bowler, he is also an aggressive left-handed batsman. Domestically, Narine has played for Trinidad and Tobago since 2009 and made his One Day International debut in December 2011 and Test debut in June 2012. Sunil made his debut in first-class cricket for Trinidad and Tobago in February 2009 during the Regional Four Day Competition, he is Indian national bowling thirteen overs without taking a wicket. He did not play another first-class match until nearly a year later, and after going wicketless in the first innings claimed a single scalp in the second, that of tail-ender Lionel Baker. On 19 January 2011, during the Caribbean Twenty20, Narine played his first Twenty20 (T20) match but did not bowl as the match was rained off before Trinidad and Tobago could bowl. T&T won the competition and Narine managed five wickets at an average of 13.40. By virtue of winning the competition Trinidad and Tobago qualified for the 2011 Champions League Twenty20 held in September and October, in which Narine was one of three bowlers to take ten or more wickets. He made his List A debut on 20 October 2011 in the Regional Super50, claiming figures of one wicket for 35 runs (1/35); his wicket that of opening batsman Miles Bascombe. Trinidad and Tobago won the competition and Narine was the leading wicket-taker in the competition with 15 scalps, five more than the nearest competitor, fellow spin bowler Nikita Miller. Narine is the all time leading wicket taker in Champions League T20 history with 39 scalps. When the West Indies toured India in November and December 2011 Narine was included in the squad. He made his One Day International debut in the third fixture on 6 December, taking the wickets of Virat Kohli and then Ravichandran Ashwin to help the West Indies to a 16-run victory. Playing in the final two matches (both won by India) Narine took one more wicket while conceding a further 87 runs. Back in the Caribbean, Narine played three of T&T's six matches in February 2012 in the Regional Four Day Competition, taking 31 wickets at an average of 9.61, and finishing as the team's leading wicket-taker and seventh overall. Australia arrived in the West Indies in March, and their tour began with five ODIs. Narine and West Indies fast bowler Kemar Roach each finished with eleven wickets and were joined leading wicket takers in the series which was drawn 3-3 . 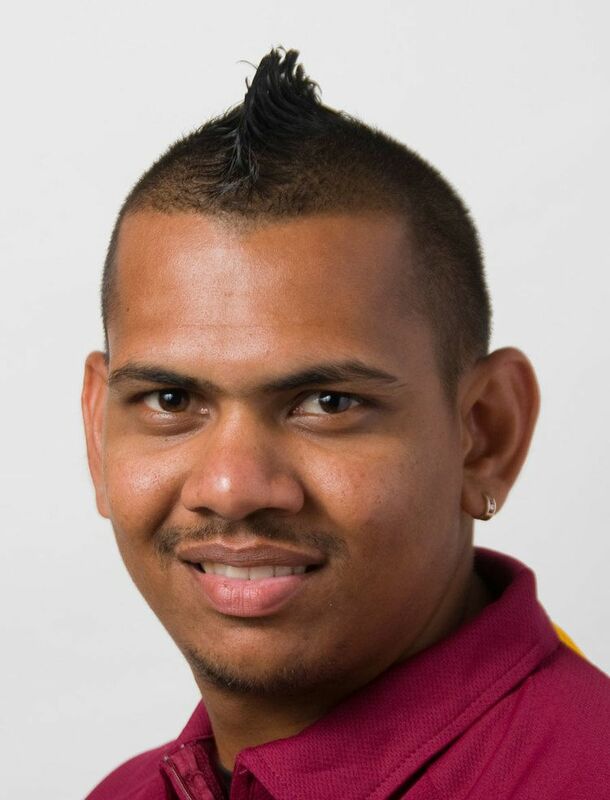 Following an injury to fast bowler Kemar Roach, and the conclusion of the 2012 IPL, Narine was drafted into the West Indies squad for the third and final Test against England in June 2012. At the time he had played just six first-class matches, managing 34 wickets at an average of 11.88. Replacing fellow off spinner Shane Shillingford in the side, Narine made his Test debut on 10 June 2012. Due to his performance in the IPL Narine was much hyped by the media, though Kevin Pietersen and Ian Bell negotiated him with ease. A superb performance by Narine of five wickets for 28 runs on 16 July 2012 helped the West Indies beat New Zealand by 20 runs in their fifth and last ODI and win the current series 4–1 at Basseterre, St. Kitts. Playing only in his second Test he was adjudged the Man of the Match after he picked eight wickets which included his maiden five-wicket haul. Narine was left out of the first 2 tests vs New Zealand. As on 8 March 2014 he topped the ICC Twenty20 rankings of bowlers with 784 points. Saeed Ajmal of Pakistan at second, was way behind in points at 714, while Ajantha Mendis of Sri Lanka with 674 points completed the top three. Narine has the reputation of a "mystery bowler", due to the variations that he has on his off breaks, and how he disguises them. Narine missed out on the final match of the 2014 Champions League Twenty20 due to being suspended for an illegal action over 15 degrees. In November 2015, Narine was suspended from bowling in international cricket, after his bowling action was deemed to be illegal. His action was reported during the third ODI game against Sri Lanka earlier in the same month. Former West Indies fast bowler Sir Andy Roberts believed that Narine should consider taking a hiatus from international cricket. In April 2016, he was cleared for bowling in all formats of domestic and international cricket.